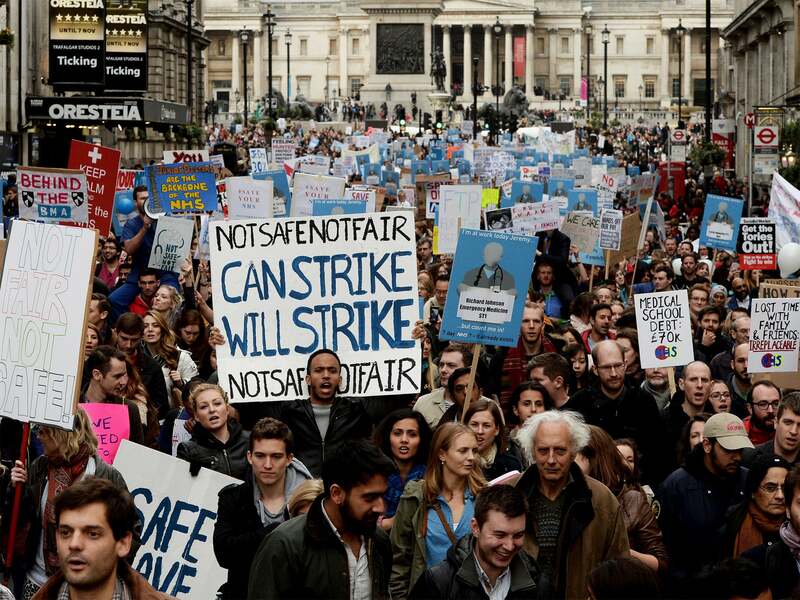 With a near unanimous majority, reminiscent of a North Korean election, an unheard of 98% of junior doctors have voted to go on strike over changes to pay and conditions being forced on them by Jeremy Hunt. Mr Hunt, the Health Secretary who was most likely to have had an unprintable nickname at his boarding school, wants junior doctors to work more unsociable hours, and to do so for less money. And the way he has treated the doctors during negotiations has wound them up so much that they have voted to not even cover emergency cases – serious strike action that has never been seen in the NHS’s history. Thinking it’s not a problem because it’s only junior doctors? Well, think again. Junior Doctors are pretty much anyone who hasn’t reached consultant stage, which can take over 10 years after leaving medical school. There are 55,000 of them in England – over 1/3 of the total number of doctors. They are key to everything that goes on in the NHS. Jeremy Hunt has also been playing games with the truth, talking about the need for a 7 day NHS. He bases this on a study which showed a correlation with admission day and subsequent death, even though the study explicitly said that there was no causation shown (and indeed it’s pretty easy to see why this might be – routine admissions happen mid week, while it tends to only be emergency admissions at the weekend, which are likely to be more serious). He also has been making vocal noises about doctors not being allowed to opt out of working weekends. But at the moment only consultants can opt out of non-emergency work at the weekend, and most of them don’t. To even imply that doctors’ unwillingness to put the hours in was causing patient deaths was, if not evil, certainly a rather stupid opening position. Unfortunately the NHS has already been run in to the ground by the Tories. We rank 14th out of 33 in Europe for health care, compared to 11th just a few years ago. Waiting times are up, with a significantly increased number of people not being seen within 18 weeks of being referred to a consultant. The government has already forced the NHS budget down by £22bn, but recently agreed to give an extra £8bn over the next 6 years – barely covering inflation. Parts of the NHS have been privatized, with hospitals being run by private companies, although the first private company to manage a hospital has pulled out of their contract. Perhaps because running emergency care is much harder and less profitable than the routine medical treatment that private hospitals are used to doing, with the backup of the NHS in case something goes wrong. Doctors tend to care quite a lot about the state of the NHS, so that’s just adding to their anger.